S. T. Joshi is a leading Lovecraft scholar and author of H. P. Lovecraft: The Decline of the West (1990), I Am Providence: The Life and Times of H. P. Lovecraft (2010), Lovecraft and a World in Transition (2014), and other critical and biographical works. He has also done significant research on such writers as Lord Dunsany, Ambrose Bierce, Arthur Machen, and Ramsey Campbell. Additional volumes in this set include Volume 1: 1905–1925, Volume 2: 1926–1930, and Volume 3: 1931–1937. Collected Fiction, A Variorum Edition, Volume 4: Revisions and Collaborations. 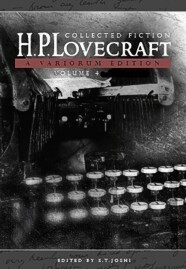 By H. P. Lovecraft, Edited by S.T. Joshi. New York, NY: Hippocampus Press; 2017; ISBN 978-1-61498-165-7; 720 pages; paperback.